Have a steakhouse experience delivered right to your door with these incredible Stock Yards® Rib Eye Steaks. 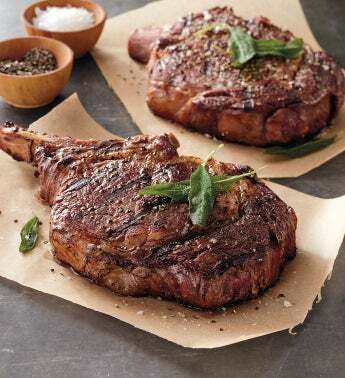 Hand-carved Chicago-style with the bone in and expertly aged for 21-30 days, these well-marbled steaks are also exceptionally tender and flavorful. Top with our Roasted Garlic Herb finishing butter for a crowning touch.